HAVE YOU SEEN THIS STOLEN BANKSY ARTWORK? A tribute by graffiti artist Banksy to the victims of the Bataclan terror attack in Paris was stolen overnight on Friday. 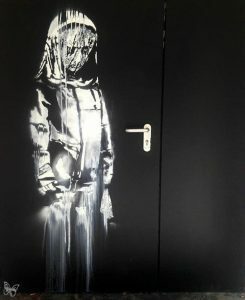 Banksy painted the work – which showed a young female figure with a mournful expression – as a memorial to the victims of the 2015 terror attack at the Bataclan Music Hall. A total of 90 people died in the attack. The artwork was cut out and removed from one of the emergency doors at the Bataclan. The venue tweeted: “We are today filled with a deep sense of indignation. Banksy’s work, a symbol of recollection and belonging to all: locals, Parisians, citizens of the world, has been taken from us’. It was taken by a group of hooded individuals armed with angle grinders who drove away in a truck.